The easiest and best way to speed up a slow computer is to replace its HDD with an SSD. This will deliver a huge performance boost, and can make an old PC feel brand new. If you’re after the best speeds and your computer has a compatible PCIe-based M.2 slot, then a NVMe solid state drive is what you should you be looking for as they are significantly faster than SATA models. That said, SATA remains the dominant interface for connecting a SSD to your PC, and for most consumers the performance improvement it provides will be perfectly acceptable -- certainly much quicker than you’d get from a mechanical drive. We took SanDisk’s Ultra 3D SATA SSD for a spin to see how it fared. As you can guess from the name, SanDisk’s Ultra 3D SSD uses 3D NAND technology, as well as nCache 2.0 for faster burst speeds. It’s essentially the same drive as the WD Blue 3D -- unsurprising given SanDisk is a subsidiary of Western Digital -- although they are aimed at slightly different markets. SanDisk’s SSD is really for end users looking to replace a HDD. The drive is available in a choice of capacities -- 250GB, 500GB, 1TB, 2TB -- and it is the smaller 250GB version we looked at here. 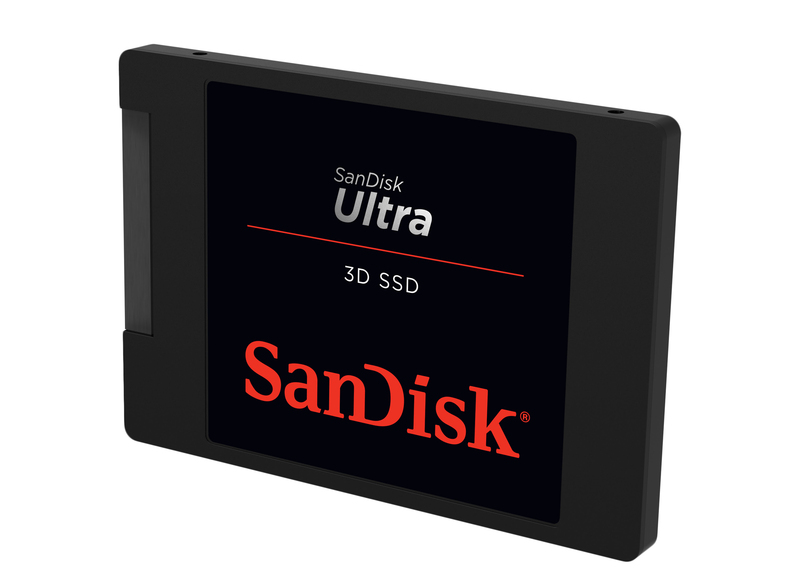 The SanDisk Ultra 3D SSD uses the same 2.5-inch 7mm form factor as other SanDisk SSDs and has the familiar dark aluminum casing and black, white and red design. SATA Revision 3.0 (6Gb/s) transfer rates start at 150 MB/s and max out at 600 MB/s. With this drive, SanDisk promises sequential read speeds of up to 550 MB/s and writes of 525 MB/s. The speeds increase to 560 MB/s and 530 MB/s in the larger capacities. In our tests, we found sequential reads came in at around 545 MB/s and writes 500 MB/s, which is very much in line with what we expected to see. Random performance for the 250GB model is up to 95K read IOPS (Input/Output Operations Per Second) and 81K write IOPS. While for the larger capacities, the read IOPS remains the same, but writes improve to 84K IOPS. The drive is shock resistant up to 1500 G @ 0.5 m/sec and its vibration resistance is 5 gRMS, 10-2000 HZ / 4.9 gRMS, 7-800 HZ. You can manage the drive though the free, downloadable SanDisk SSD Dashboard. This lets you view the drive’s details (model, firmware version, S.M.A.R.T health and so on), status (including drive usage, life remaining, and temperature), and performance. There are a number of tools accessible from here too which you can use to perform a firmware update, erase the drive, and so on. Price wise, the SanDisk Ultra 3D SSD costs $79.99/£63.25 (250GB), $119.99/£106.98 (500GB), $249.99/£214.26 (1TB) and $499.99/£379 (2TB), which is very reasonable. Shop around and you can likely make some good savings. The 500GB model is currently available for $67.99 on Amazon. Overall, the SanDisk Ultra 3D SSD offers great performance at an attractive price point. If you’re looking to replace an HDD or give an old system a new lease of life then this is a wise choice.